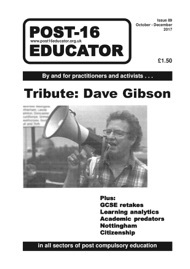 This is a collective blog dedicated to offering a data-informed critical analysis of developments in the higher education sector, which is seeing an unprecedented transformation at the hands of Tory privatisation and marketisation. Rather than constant updates, this website will try to analyse developments holistically and historically, covering events over a longer period and culminating in longer articles that aim contextualise and interpret what is happening. We will also try to offer visualisations of important data that can be used to make high-impact critical points, and also shared across social media. Our audience, in contrast to existing websites like Wonkhe or lobbying groups like Universities UK, is imagined as primarily made up of academic activists working in trade union branches or in activist groups. We hope to have a growing number of contributors covering a wide range of topics, related first and foremost to the UK context, but hopefully also internationally. We would also like to expand our coverage to include what is also happening in further education.